A beautiful ship for elegant cruising experiences. Royal Princess is sister ship of the Regal, Majestic and Sky Princesses. Cruising the Caribbean and Mediterranean as well as North and South America, there is sure to be a route to amaze you. Enjoy interactive shows, art exhibits, a casino, library and photo gallery. There are also other activities available such as cooking demonstrations, mystery evenings and quiz shows. There are a vast number of dining choices onboard. Casual dining areas include 'Horizon Court', 'The Pastry Shop', 'Alfredo's Pizzeria', 'International Cafe' and 'Vines'. To avail of a more traditional taste, you should visit the 'Chef's Table Lumiere'. 'Sabatini's' and 'Crown Grill' are two dining areas which cater for passengers in search of more elegance and regional flavoured meals. Try some Italian-inspired cocktails at 'Bellini's' or martinis from 'Crooners'. With sports centers, lawn games, Lotus spa, golf putting and jogging and walking tours onboard, the wellness of the passengers is truly taken care of. On board the Royal Princess, you can choose between different categories of Inside and Balcony Cabins, all of which leave no wish unfulfilled. Numerous elegant Mini-Suites and Suites are also available for guests looking for a truly luxurious cruise holiday. Suite passengers are granted access to the new Concierge Lounge, where dinner reservations, spa treatments and shore excursions can be booked in order of priority. All cabins on board the Royal Princess boast an elegant colour palette and a cosy atmosphere. The Royal Princess offers a world of culinary delights with excellent service. In addition to traditional dishes, the specialty restaurants on board also offer a variety of international cuisine. With everything from a seafood bar to an Italian pizzeria and a sushi and tapas bar, there's something offered for every taste. Thanks to the 24-hour buffet restaurant 'Horizon Court', you can enjoy freshly prepared meals around the clock. Do you prefer savouring your meal in the privacy of your own balcony? No problem, a sumptuous four-course meal will be served as part of the onboard 'Ultimate Balcony Dining' experience. Coffee, tea, water, and iced tea are all on the house in the buffet restaurants. In total, there are 15 decks full of dining options. The diverse entertainment programme on board the Royal Princess offers great variety for every passenger. The schedule for the following day will be distributed to each cabin daily, allowing you to plan your time as you please. The new entertainment space, 'Princess Live!' provides seating for 280 guests. You can enjoy the 'Wake Show' with its game shows, cooking demonstrations, mystery evenings, quiz nights and acoustic music performances. The 'Princess Theater' and 'Vista Lounge' are also known for their exciting gigs and performances. After sundown watch an incredible light and water show in the pool area or catch a first-run at the 'Movies Under the Stars' - an open air cinema. If you would like to spend your evening in a more intimate atmosphere, make yourself at home in one of the bars or lounges, like the 'Wheelhouse Bar' or 'Promenade Lounge' and finish your day relaxing with a delicious cocktail and getting to know other onboard guests. There are many different options available on board the Royal Princess, both for staying active and relaxing. Let your worries float away with a massage in the exotic 'Lotus Spa', pay a visit to the beauty salon or take a dip in one of the seven whirlpools on board for ultimate relaxation. The pool on the Sky Deck is for adults only, ensuring a serene atmosphere. A modern fitness studio and tennis courts on the Sports Deck give you plenty of opportunities to power up. The younger guests on board will also have lots of fun with the daily animations, interactive shows and a professional childcare team, that is available until midnight if needed. Art enthusiasts should not pass up a trip to the art gallery. Other features of the Royal Princess include a casino, internet café, library, tourism office, photo gallery, and a small chapel. A visit to the “Seawalk” on the Sun Deck of the Royal Princess is truly a unique experience. This glass walkway that is 39m over the foamy sea guarantees a breathtaking view comparable to that enjoyed by the captain on the bridge. The 'Sea View Bar' also offers a spectacular panoramic view. Enjoy an exotic cocktail while watching the waves through the glass floor. On the 13th of June 2013, in the port of Southampton, this ravishing Cruise ship was baptized into the family of Princess Cruises by none other than her Royal Highness – The Duchess of Cambridge. 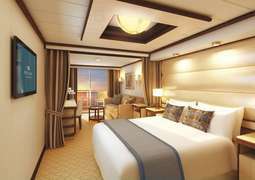 Since her royal debut some dazzling new features have been added to the Ship. With 19 decks on board, the Royal Princess offers a wide range of entertainment and fine dining for all ages. Experience the royal treatment while relaxing poolside or in the Spa, or while indulging yourself in all this sparkling cruise ship has to offer. 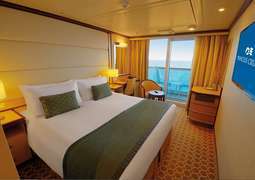 There is a huge variety of accommodation on board the Royal Princess. 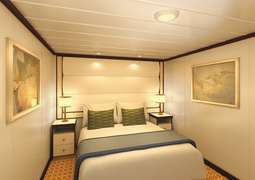 Staterooms vary from a basic yet comfortable Interior Stateroom up to a Suite with Balcony. With a choice of seven different types of Staterooms, you are sure to find the one that fits you perfectly. Enjoy the touch of royal luxury with daily cabin service in all rooms. With a wide range of dining options, you are assured to have whatever you are craving at your fingertips on-board the luxurious Royal Princess. Whether it is traditional or anytime dining, you are guaranteed to find the perfect dining experience for all. For all those birthdays or any special occasions, on-board there are more elegant and sophisticated restaurants to celebrate your special night out, one being The Crown Grill which was voted one of the “Best Cruise Ship Steakhouses” by USA Today! The wellbeing of the passengers on-board the Royal Princess is one of the team’s priorities. With the wellness facilities on-board being of superb excellence, the passengers have a variety of sports and activities to choose from. Get your heart rate pumping with a choice of exercise classes such as spinning or make use of the gym machines or jogging on the outdoor track, whatever your personal appeal is. After, enjoy a well-earned chill down by the Retreat or Fountain Pool.